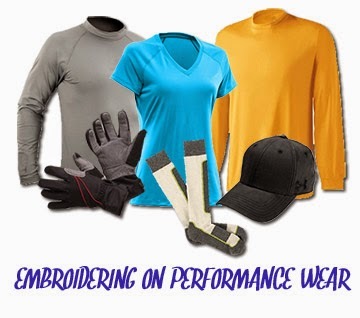 6 Billion Reasons Why You Need to Master Embroidering on Performance Wear! I suspect that the same embroiderers who avoid using metallics because “it’s too difficult” avoid embroidering on performance wear because that stretchy fabric is allegedly difficult to deal with, as well. Am I right? But, as it is with metallics, once you know how to do it, the struggle is all but eliminated. It’s so important for you to master embroidering on performance wear because of its popularity in the athletic and team sales market, plus work-out apparel including Yoga, dance and ballet, and cheer squad outfits. Six billion dollars’ worth of popularity, when the industry’s value was last calculated! Here are the four keys to overcoming your fear of performance wear-y J embroidery. Master your choices of the design, the backing, the hooping and the thread selection, and you’ll be golden. Inasmuch as performance wear is so stretchy it is prone to major distortion, the greater the number of stitches, the more likely distortion will occur. You may have to gently urge your customer away from the huge 15,000+ stitch design they may love, to a more subtle and lower stitch count logo. You could point out the embroidered logos of some of the major athletic companies like Xersion, Under Armour, Nike, Bamboo and Pizzazz, whose embroidered logos have simple (yet elegant) low stitch counts. Remember to reduce density wherever possible on Performance Wear apparel. Too much density will cause puckering and distortion and lumpy-looking embroidery. And please note: In order to prevent that reduced stitch count from adversely affecting your income, suggest using their very large and beloved design on their team jackets, sweat shirts, booster pennants and warm-ups, which you would be happy to do for them. As you know, a synonym for backing is stabilizer, and no material in the world defies stability, as it pertains to embroidering, like performance wear. Think of wet spaghetti! It’s common for embroiderers (not you, of course) to pile on the backing and overcompensate for the lack of stability of the material; the net result being a blob (not blog) of backing standing out stiffly and probably irritating the wearer. Too much backing, especially the wrong backing, can be worse than not enough. I recommend the best stabilizer to use for most performance wear is no-show nylon commonly referred to as Weblon. It usually has a diagonal embossed pattern that makes it more stable and offers the maximum amount of multi-directional stability in a light weight material. This means it is easier to hoop (but not too tightly), allowing for the good registration and least amount of puckering and looping. This product is great for designs up to about 8,000 stitches; two pieces may be used for larger and denser designs, although if you really need that much stabilizer you may want to get your customer to rethink the design. No-show Weblon has other advantages: it is very soft, so it feels better against the skin; it weighs little and is all but invisible when viewed from the front. Another option is pairing Weblon with a light -- 1.0 or 1.5 oz. -- Tear Away. Adding the Tear Away will provide stability and softness. Make sure you put the Weblon closest to the apparel and the Tear Away behind it. Then just tear away the excess Tear Away (I know it’s childish, but I love saying “tear away the Tear Away”), leaving the soft, invisible Weblon against the body. When you hoop your performance wear, ensure the fabric is smooth and firm. It needs to be hooped tight enough to prevent movement, but not so tight that it distorts the fabric. If you hoop it too tightly, the fabric will contract when you take it out of the hoop and your well-embroidered design will be puckered and look crappy (an old embroidery term meaning your customer won’t be coming back). Be sure that the backing covers the hoop completely establishing a nice, firm base that will prevent the embroidery from bouncing during the sewing process. If there are no wrinkles in the hooped fabric and the material isn’t stretched, your hooping is well done. If slippage is a concern, try using an adhesive spray which will hold the garment in place and minimize slippage. When it comes to thread, you can use any good quality rayon, polyester, metallic or specialty thread. Rayon is a softer thread, therefore more conducive to lying down in any direction well. This is necessary when working with such a thin, pliable material such as performance wear. So I recommend rayon as a first choice. And remember the quality part! Be sure to use a ball point needle, either #70/10 or #75/11, which will cut down on the looping caused by the fabric bouncing. Seriously, it really works. So, embroidering on Performance Wear isn’t impossible or even difficult; it merely entails some additional thought be put into the process. Following the guidelines above will ensure a “no-worries” experience for embroidering on all sorts of performance apparel. And remember, practice, practice, practice!